I'm still not caught up on Kasie West's books (Love, Life and the List is next), but after not feeling By Your Side as much as I wanted and being disappointed in Lucky in Love, I'm glad to announce I really liked this! 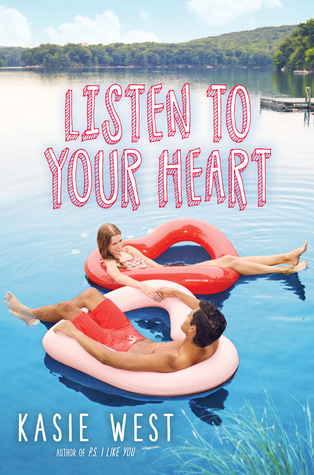 Listen to Your Heart had all the fluffy, swoony feels that makes Kasie West one of my go-to authors when it comes to YA romance. The main character, Kate was super likable and she had a great, almost sarcastic sense of humor. The love interest, Diego was adorable. And the side characters were well-developed. I loved, loved, loved Kate's relationship with her best friend, Alana. Judging from the main romantic theme--falling in love with the best friend's crush, I was terrified KW would write one of those "girls fight over boy" scenarios. It was a happy surprise to read about two smart and mature young girls talking about stuff and finding a way to deal with their feelings without resorting to drama and shaming. Frankie was another favorite. I loved how once again KW didn't go the obvious way with him. It was amazing to see their rivalry turning into friendship, and there was even a moment or two there Frankie got me shipping him with Kate. Sorry, Diego. There were some pretty great moments with the advice podcast and with Kate's family, especially how healthy and absolutely adorable her relationship with her brother was. I felt so bad for him because of the things he was going through, but it was heartwarming to see how dedicated Kate was to making sure he felt safe and loved. Same goes for her relationship with her younger cousin. Cute, light and swoony, Listen to Your Heart had all the elements that make Kasie West's books sucessful. No wonder I'm always excited to see KW announce a new book, even though it seems like she writes a hundred new books per year.